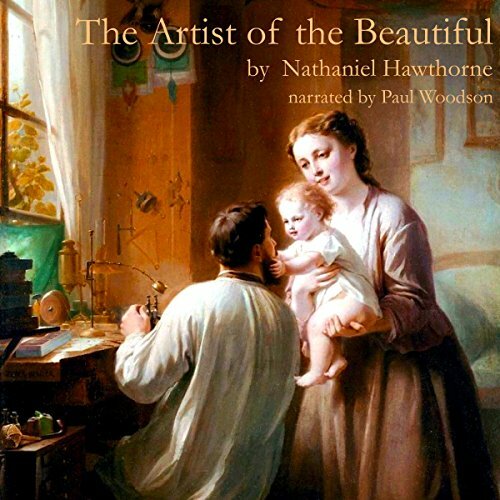 Nathaniel Hawthorne, author of The Scarlet Letter and The House of the Seven Gables, explores the themes of artistic temperament and the meshing of nature and technology in this charming little tale. A wonderful, Short Piece, Excellently Delivered! I was given this review copy for an unbiased review. I enjoyed the story as a whole. Such a wonderful period piece. The intonation, cadence, and passion performed by Paul Woodson made the story more enjoyable. His ability to put you into a room like a fly on the wall, watching as the story unfolds is noticed in his smooth, yet capturing delivery. Well Done. Where does The Artist of the Beautiful rank among all the audiobooks you’ve listened to so far? This is one of the better classical short stories I've listened to or read. In just an hour, Hawthorne, tells a tight and beautiful story about one mans life and obsession with beauty and life. It is bittersweet, but the main character does not view it as so. Paul Woodson is a superb narrator. Just take a listen to the audio sample, and you'll see what I mean. I generally speed my listening up at least a bit, but did not do it for this one at all. His voice was just too spot on. Plus, I knew it was a short story and I didn't want it to end. The final scene has to be the favorite. I imagine that will the be the case for any listener - which is exactly what a good short story should do. I admittedly really disliked The Scarlet Letter. Did not enjoy it in school, and I tried several years later to give it another chance, and disliked it even more then. I've avoided touching anything else by Hawthorne since. I'm so glad I was given this book to listen and review because now I see there may be a different side to the author that I will enjoy. I received this book for free from audiobookblast dot com in exchange for an honest review. The narration by Paul Woodson was wonderful.The story was,as I am finding all 'classics' to be...beyond my understanding.A watchmaker is striving to create the most beautiful thing.When he does he does not seem satisfied though those around him are.